This skirt is my new obsession. I bought this a couple of weeks ago but before that, I had been hunting for ages and found a few but finally managed to narrow it down to this one from Loavies for £30! 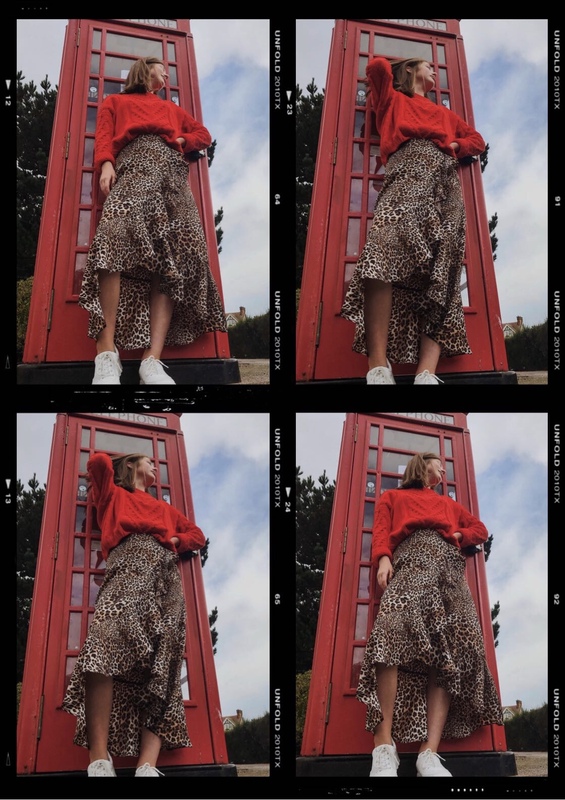 Obviously my leopard print collection needed to grow some more (it really didn't) and this skirt is such a fun piece to have in your wardrobe. 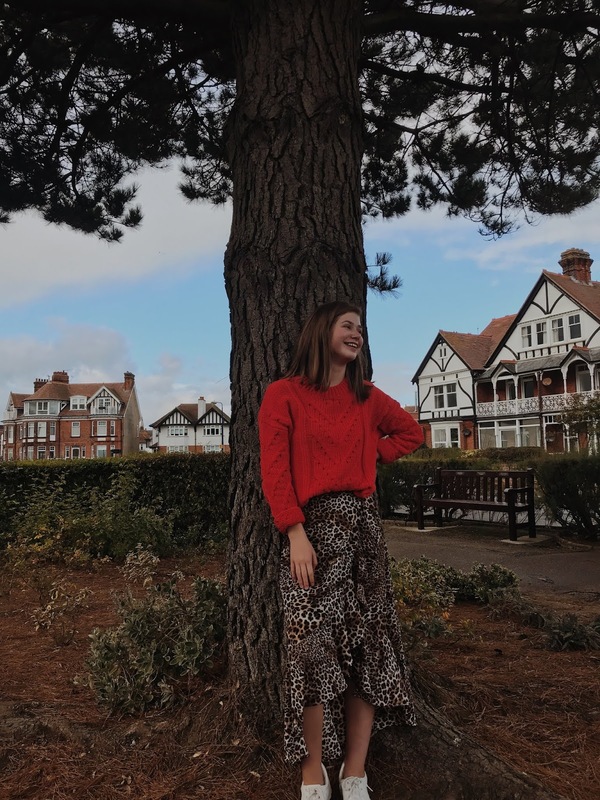 I have loved styling it and have worn it with a variety of different colours: neutrals and bright colours like this red jumper. I bought it last year from Pull & Bear via Asos so I don't think they will still have this exact one, maybe one very similar. Although bold colours and neons are very in this year so I can imagine lots will be stocked in many shops. 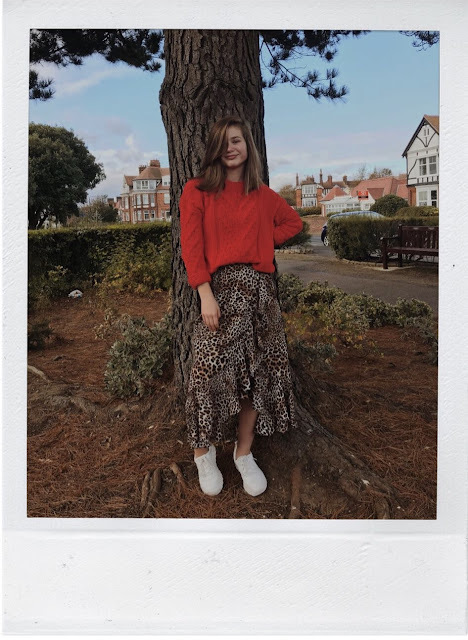 I love the contrast between the vibrancy of the jumper and neutral pattern in the skirt and think it's such a cool look to pair with white trainers. I basically pair everything with them but the white just makes the outfit pop and stand out even more. Even though it's starting to get seriously cold, I'm not sure I'll wear this skirt with tights. Instead, I'm going to have to wear big huge knits and face the bare legs! 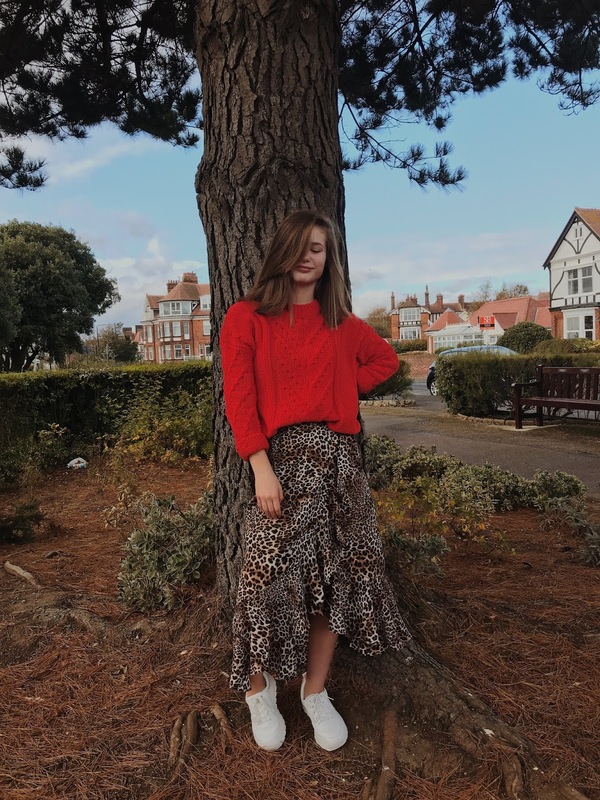 But what I love about this skirt and why I chose this one is because I know I will wear it year after year and in every season, even if leopard print is no more a trend. The ruffles create a lovely silhouette... and very good boomerangs. As well as wearing the skirt with this beautiful red chenille jumper, I have worn with a plain black fine knit (see in my previous post) for a more simple look. I can't wait to style it with other colours such as mustard, cream and navy that I've been fantasizing (weird but I think about styling A LOT) about for a while. I mentioned the price at the beginning and in my opinion I think it is a bit over priced (there isn't a lot of material and it's quite thin but not see through) looking for a skirt like this. I love it to pieces! I would just say to say to size down though as I'm a size 8 normally but I bought a XS and it's just small enough. Thank you so much to my friend Holly for taking these cool photos of me, thank you! omg you look AMAZING!! I adore this skirt so much, definitely worth the splurge for it as it looks SO incredible on you!! I need to shop at Loavies more!! And these pictures are so so fab!